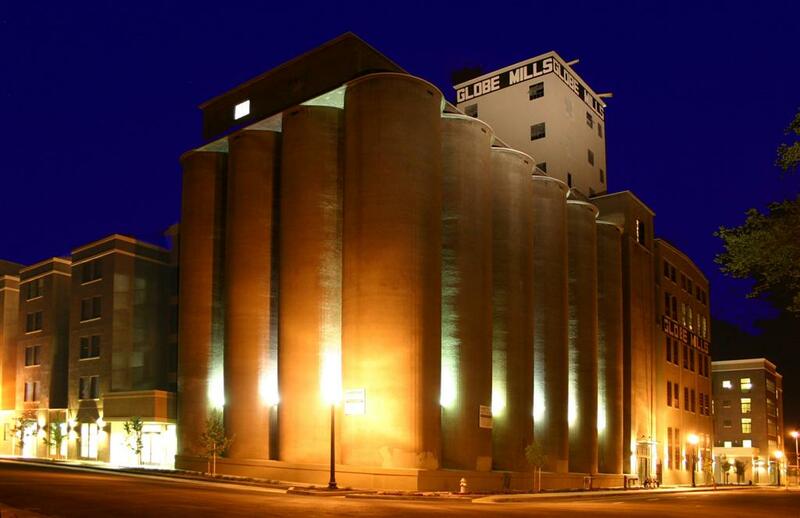 The Globe Mills has been selected as a winner of the American Society of Civil Engineers - Sacramento Section's Outstanding Engineering Project for 2009 in the "structure" category. Cyrus Youseffi and Miyamoto International, Incorporated were recognized for their contributions to the project. "Local Architect Does A Good Thing." 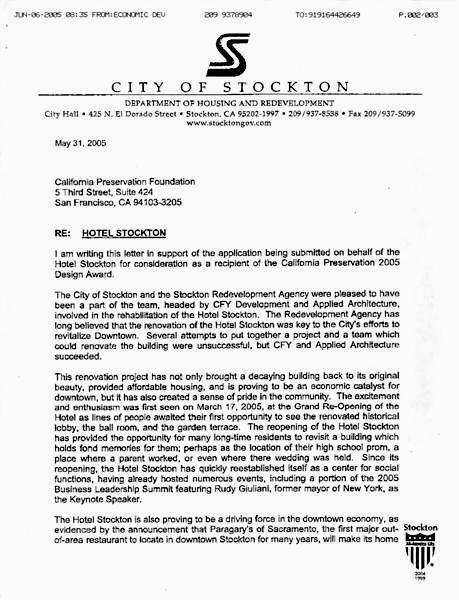 For The Hotel Stockton. "This renovation project has... brought a decaying building back to its original beauty, provided affordable housing, and... created a sense of pride in the community." 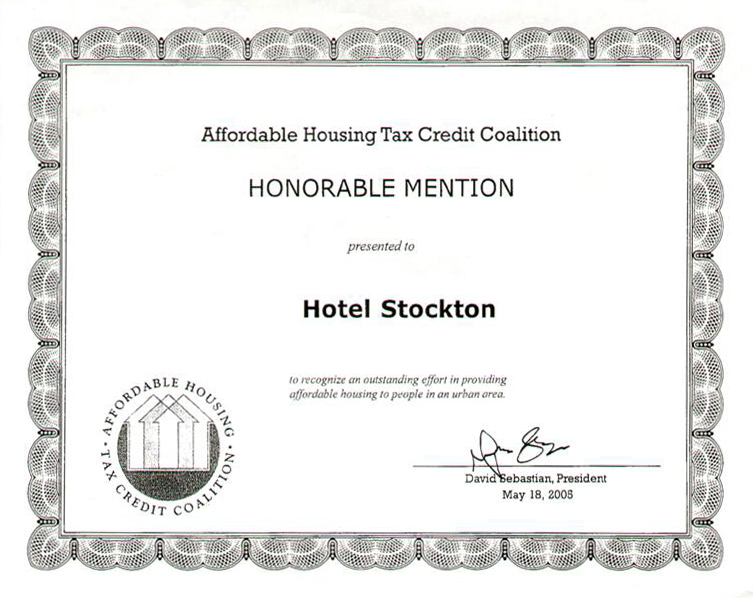 For the renovation and adaptive reuse of The Hotel Stockton and its contribution to the revitalization of downtown Stockton. 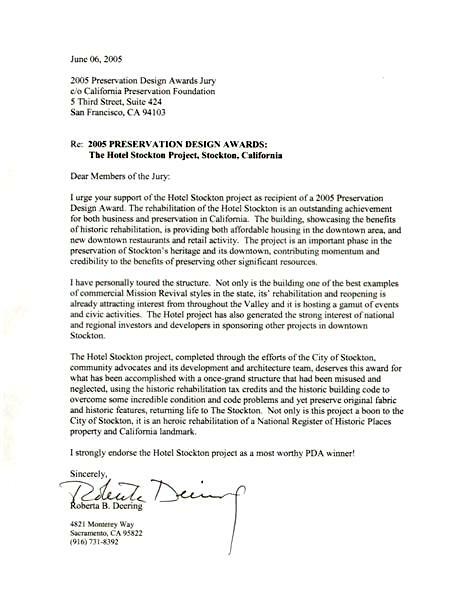 In public recognition of Michael Malinowski, AIA, for "extraordinary efforts" in the rehabilitation of The Hotel Stockton. Awarded to Michael F. Malinowski, AIA, to recognize "an outstanding effort in providing affordable housing to people in an urban area." 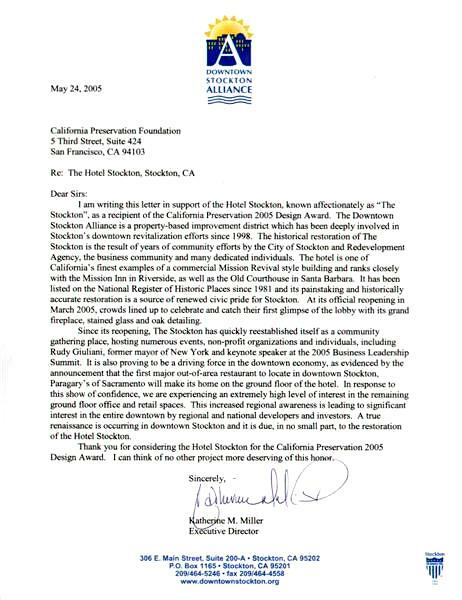 Presented to Michael F. Malinowski, AIA, 2005 Communications Committee, in recognition of commendable service. 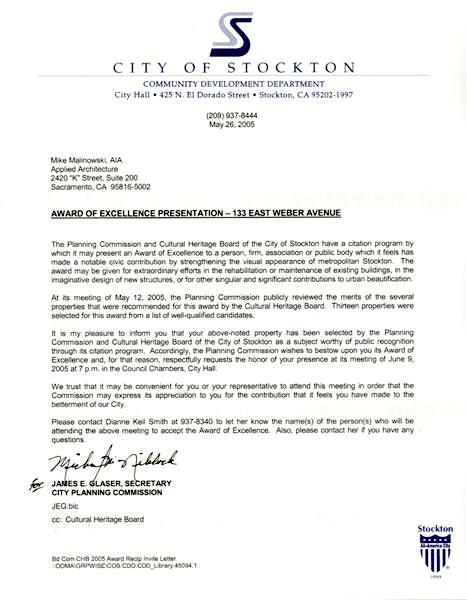 Presented to Michael F. Malinowski, AIA, in recognition of "commendable service to the Chapter and Architectural Profession as a member of the City of Sacramento's Development Oversight Commission." Presented to Michael F. Malinowski, AIA, in recognition of "outstanding citizenship and activities enhancing community betterment as a member of the Design Review and Preservation Board." Presented to Michael F. Malinowski, AIA. Presented to Michael F. Malinowski, AIA, 1986 Design Awards Chair, in recognition of commendable service. Presented to Michael F. Malinowski, AIA, 1994 Speaker's Bureau Chair, in recognition of commendable service. Presented to Michael F. Malinowski, AIA, 1999 Commissioner. "Love of Wisdom, the Guide of Life"
Presented to Michael F. Malinowski, AIA, Associate Seminar, in recognition of commendable service. Presented to Michael F. Malinowski, AIA, for his contributions to the profession of architecture as an Oral Exam Commissioner. Awarded to Michael F. Malinowski, AIA. Presented to Michael F. Malinowski, AIA, "For Excellence in the study of Architecture." Awarded to Applied Architecture, Inc.
Michael F. Malinowski, AIA Official Ribbon.